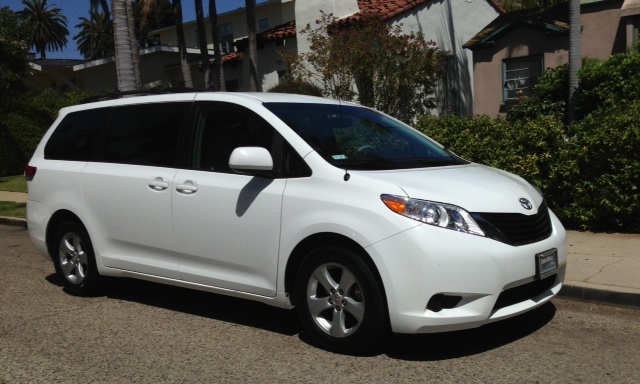 I bought a new car – a minivan! No, I’m not a mom transporting children to activities or shopping daily at Costco. In fact, most women my age are downsizing now that their children have flown the nest. 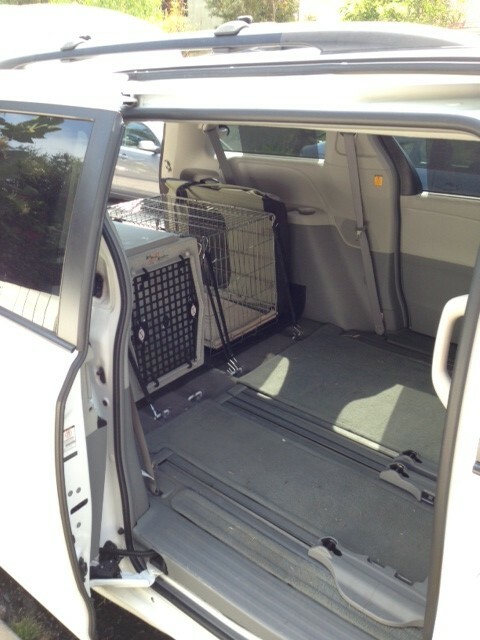 I bought a minivan because I compete in dog sports. 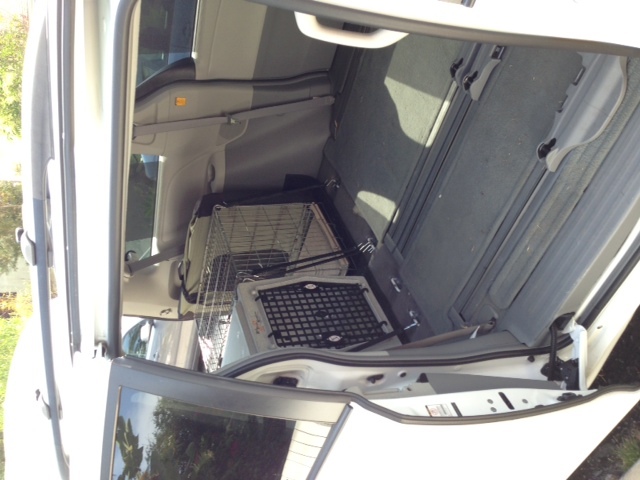 Transporting dogs requires crates and attending trials requires more equipment than I ever imagined. 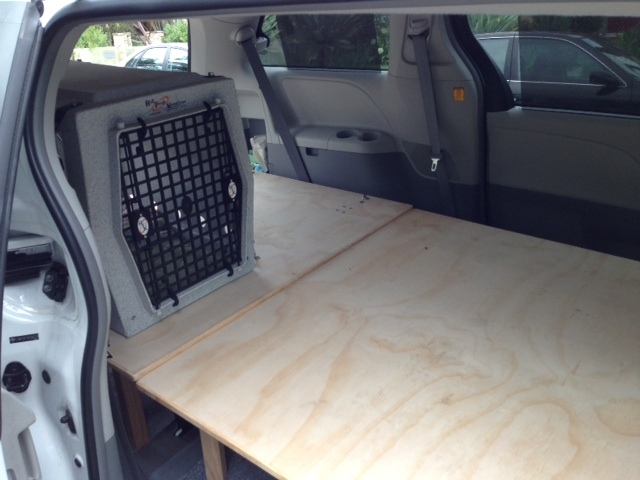 My Passat wagon was stuffed to the gills and I needed an advanced degree to pack it. So I got a van. 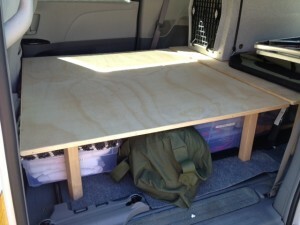 I took out the middle seats and folded down the third row et voilà– lots of space! 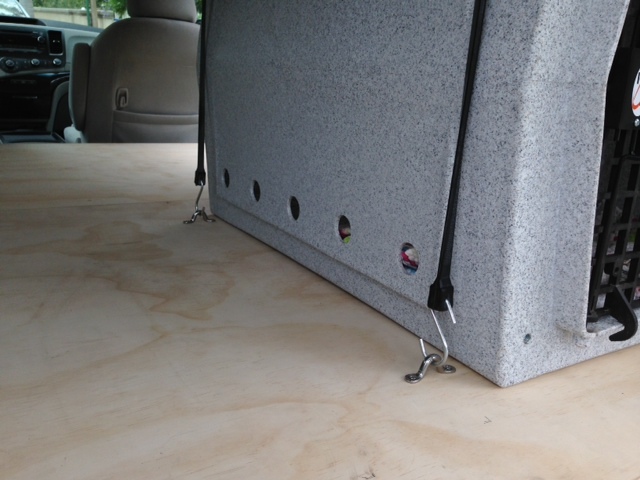 I can tie down the dog crates in back and I’m good to go, right? Wrong. Although there are lots cubic feet, they’re not very useable. The rails for the middle seats protrude from the floor and the only way to use the headspace is to pile stuff on top of stuff. I’m a professional organizer. I discourage inacessible piles and practice my own advice to use vertical space. I needed to create levels of storage. I needed platforms that would be high enough for standard sized plastic bins and low enough for dog crates on top. Did I mention my planned cross-country drive/camping trip with my dog? There was going to be a lot of gear. 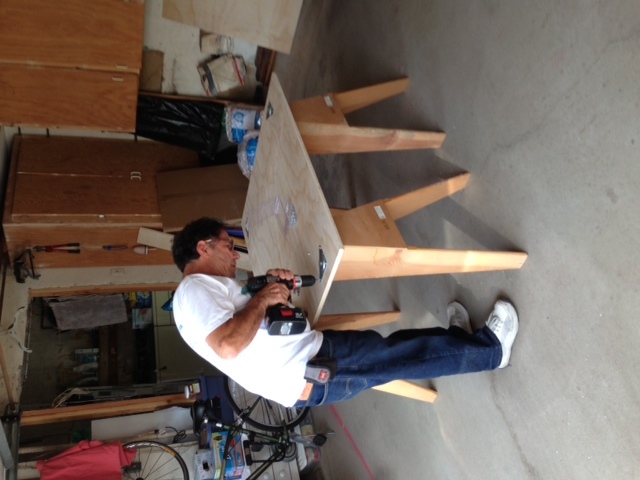 A friend’s father built platforms specific to my needs. 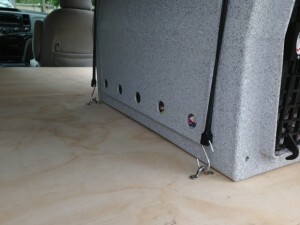 For safety, I wanted to secure the dog crate to the platform and the platform to the body of the car. The spare tire is under the folded-down rear seats so I needed platforms I could remove easily. 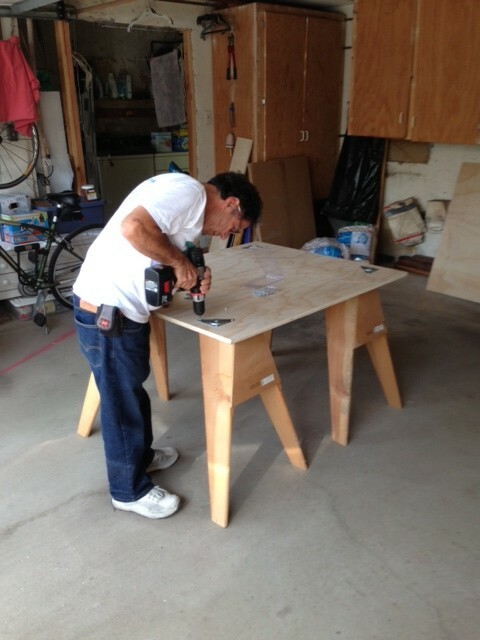 We built two foot-high platforms supported by table legs and brackets. Two platforms gives me more flexibility and since the table legs screw into the brackets, it is not difficult to disassemble the platforms and remove them. With some hardware and straps from Home Depot, I was in business. 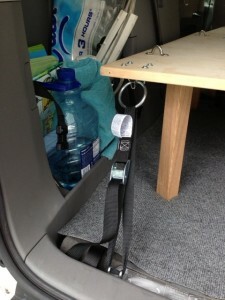 On my cross-country drive, I could store most of my gear out of sight to prevent theft. An added bonus was I could sleep on the platform if necessary. 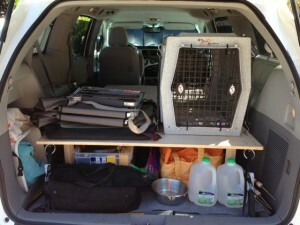 Van is packed for a five-week cross-country jaunt with dog! Since returning, I’ve competed at trials and the van easily carried two dogs, a shade canopy, aluminet shade cloths, ground cover, folding chair, stakes, mallets and clips not to mention the folding crate, dog treats, water, toys and leashes! great use of lots of space! Minivans are the best! Replace those elastic cords with ratchet type tiedown straps, those elastic straps snap pretty easily under impact stress. This will release your crates and potentially send the hooks flying. Thanks for your comment! Since this was posted I have replaced the bungees with straps. 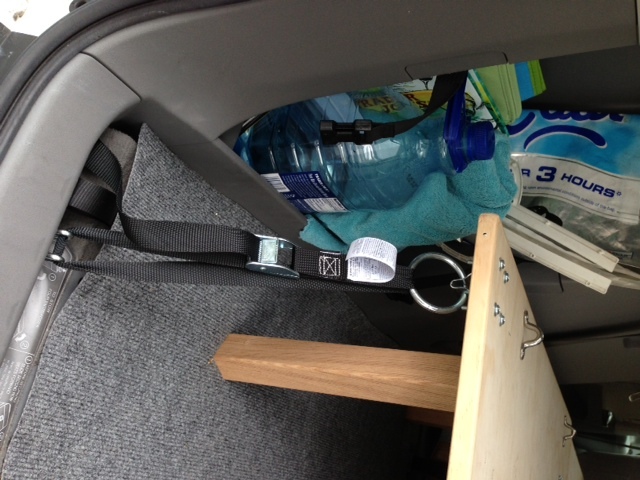 I also have straps from the back of both crates to the tie downs built into the frame of the van to keep them from sliding forward. Looks awesome!!! Thank you so much for allowing me to add you to the resources for our FB group, Dog Sport Vehicle Ideas & Setups. I am now going to read through all of your non-dog related stuff. It looks great too. Thanks so much.